Flattering50: Still Learning: Lace in the Workplace? Still Learning: Lace in the Workplace? Last August, I bought a lace skirt at Ann Taylor (above). I'd just been to the Metropolitan Museum of Art to see the "Schiaparelli and Prada: Impossible Conversations” exhibit and was in the mood for a new fall skirt. (I'm always in the mood for a new skirt when I look at Prada clothing!) I loved the Ann Taylor skirt's beige lining, which made the lace stand out, and its fun flounce (see below). The thing is, as I perused my closet last weekend, looking for something to wear, I came upon the lace skirt and realized--to my dismay--that I had only worn it three times since August. I'd worn it on Thanksgiving and to a couple of December parties--that's all. The skirt seemed too dressy for most casual activities. Saturday night, I wore it out to dinner and to the theater. And I'm determined to wear it a few more times before I put it away till next fall. So...I've been wondering: Can I wear a lace skirt to work? THE LACE SKIRT: TO WORK OR NOT TO WORK? I know that workplace dress code means a lot of different things. Not everyone works in an office and even among offices, there's a lot of different dress codes. In my office, the only dress code rules seem to be 1) no jeans and 2) nothing revealing. Women don't have to wear suits or even a blazer at my job. A sweater plus slacks or a skirt is fine. But what if the skirt is lace? 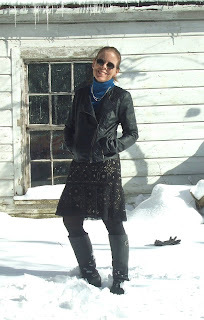 On Sunday, I tried my lace skirt with a few sweaters and tops. The tops are all things I'd worn to the office with other skirts. When I saw the photos, I thought, "Silly me! Of course, I can wear my lace skirt to the office. But I'd love to know what Flattering50 readers think: Would you wear a lace skirt to your workplace? Or with something else? What do you wear your lace skirt with? Wedding Guest Attire: Hold the Hosiery? Giveaway Winners: Where Do You Shop?